Hello and welcome to our blog here at SocialGear; I’m Riz Nwosu. Smart brands know the importance and value of Instagram to their businesses and how it could help them spread awareness about their products or services. 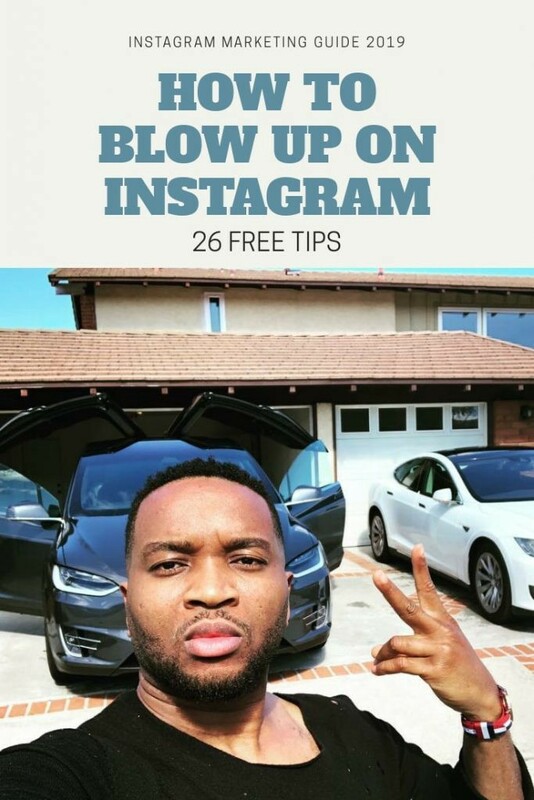 This article will walk through effective strategies on how to blow up on instagram and build the page you deserve. With Instagram’s quick growth to 800 million users, it’s no secret that businesses can grow outstandingly on the platform. In 2016, Instagram was seen as the ‘happiest place to be on earth with users ‘liking’ over 4.2 billion posts per day. That’s super, super huge which makes Instagram a ‘Gold Mine’ for Marketers in 2019 and beyond. About 80% of users follow at least one business account. Also, Instagram says 75% of users take action like visiting your website, checking your products/services or buy after looking at a brand’s post. To back this up, over a third of Instagram users have used their mobile to purchase a product online from the platform. To be able to tap into this ‘Gold Mine’ and grow your business, you need fresh ideas, strategies and that’s exactly what this article is about. Is your Instagram profile ready to convert visitors into followers? Have you optimized your photo, bio, call-to-action, and link? Your account’s growth on Instagram depends on two (2) things; the content you post & how well you optimize your profile. Two-third of profile visits to businesses on Instagram come from people who aren’t following that particular business. What this means? A good number of people who don’t already know your brand will visit your page. How well & professional your page looks is what gets them to hit the follow button. Switch to a business account. Have a great, informative & enticing bio. Pick a username that’s simple and easy to remember. Use a professional branded profile image. Have a CTA or your website URL. A great profile is only half the equation; great content makes a page follow-worthy. If you want to grow your business with Instagram, creating high quality, engaging Instagram content is more important in 2019 than ever before. To post great content that grows your followers, you need to have a strategy to stand out from the crowd. As more people join Instagram, the platform’s algorithm gets tougher making it hard for brands to stand out. Focus on high-quality instagram content and stick to a posting schedule. Hashtag is no new feature on not just instagram but in the social media-verse. If used effectively, it can grow your account quickly. A hashtag is a word or phrase preceded by the pound sign (#) which enables users group certain discussions on social media. These tags bring together thousands and even millions of people around certain topics. Find hashtags related to your niche and follow real accounts that you like. Unless you’re a large, well-known brand, you probably can’t get away with not following people back. Nowadays, majority of people (I included) use third-party tools that tell them who’s following back and who’s not. Go through your followers and check their profiles to find those worthy of your follow back. Whether you’re a brand or a personal account, you should make it a priority to find and follow similar accounts to yours. This helps tell instagram what your account is about hence suggests you to other related users. This is especially important if you’re just starting out on the platform. If your business has multiple active social media platforms (and this should hopefully be the case), you may want to give some thought to cross promotion. Include links to other social media profiles in your social media accounts. For example, you could drop a link to your Instagram page in your YouTube description OR send out a link to your Instagram on your Facebook page. Remember to cross promote and not cross post because all social platforms are not the same. One of the strategies that’ll really blow up your Instagram page is collaborating with other relevant accounts. All you need to do is to find relevant Instagram accounts in your space that have more followers than you do and offer to collaborate. For instance, you could offer to give them free quality content if they could tag you in the caption. Instagram giveaways are limited-time promotions in which brands promise to give away a product or service to one (or more) lucky entrants according to a specified set of criteria. Sometimes the prizes are incredible, while others may be something little (like a shout out). Regardless, lots of people would follow your account in order to stand a chance. Following users recommended by Instagram helps tell the algorithm what your page is about. Also, some users may follow you back. This little trick helps build better connection with your followers and could also stop your followers from hitting the follow button again (to unfollow). Unlike Instagram, platforms like Twitter are all about constant news-like, micro conversations & interactions about every minute. That’s not the case with Instagram as you could easily damage your engagement rates by over-posting (posting more than your followers can take). Try to limit yourself to 1 or 2 posts per days. Spend less time on frequency and more time on quality. Here at GetSocialGearSocialGear, we make this a priority. When you sign up with us, we basically focus on creating quality and engaging content that’s perfect for your audience. Start your free 3-day trial here! Just like any other social networking site, Instagram is all about engagements. The more engagements you can ignite, the better your chances of blowing up on the platform. Most times, brands do this by commenting and/or starting up relevant conversations on posts by certain influencers. When celebrities post on Instagram, you still see brands like @Apple, @Nike comment on his posts. By doing this, you will be exposing your brand to 1000s of other commenters out there. The strategy here is; because they comment on similar posts, they’ll be likely to check your page out and engage too. Research shows that Instagram users spend around 28 minutes on Instagram Stories on a daily basis. This feature is one of the fastest growing feature on social media today. Infact, sites like Facebook, Messenger & WhatsApp have all adopted this status-like feature too. Users may not visit your page hence wouldn’t know you have new posts but your story will always pop-up at the top of your followers’ feed. This makes it more possible for them to see it. To publish your Instagram posts to your stories, head to your profile and select the post; hit the ‘send’ button then select Add Post to your Story. Why’s video so important and everyone talking about it? Videos are naturally engaging and can convey more information in a shorter period of time, so it’s no surprise they’re getting the results we’re seeing here. When Instagram rolled out, it was all about the pictures. Now, it’s more accurate to say video has pretty much taken over. Craft out a video strategy for your brand and get a posting schedule to stick to. Compelling Instagram captions will lead to more engagements. Great captions will get you more likes, comments, and shares. Captions can go as much as 2,200 characters (not words) in length, include emoji, and up to 30 hashtags. Find out what caption length works best for your brand. Once you know who you’re speaking to, you can then tailor the best captions your followers want to see. Also, take time to know your brand voice. Do your followers want to hear stories? Or just a bit formal type of captions. Test different things and use it to shape your voice. The rise of bots and fake accounts have made a lot of Instagram users question the validity of the comments we get on our posts. However, it is still very important to check your comments and respond to the best of your ability. Instagram wasn’t created for bots to spam every comment section they can; rather for humans to be social. How then can your brand be social when you don’t reply to comments? These could be words from your fans, greatest followers, customers/clients or people looking to do business with you. Take the time to reply to all real comments on your posts. If possible, ignite discussions by starting comment threads on your posts. If you’ve been on Instagram for just 5 minutes then you should’ve come across a post like the one above. They’re literally everywhere! People love text images that includes maybe a quote, meme or even a tweet. People engage relentlessly with these. An uplifting, motivational post can resonate with your audience. There are even entire Instagram accounts that are devoted to only posting write-ups and quotes. In fact, they may even outperform normal images in terms of engagements. These are words of Jason Stone, Engineer who went from starting on Instagram to making millions of dollars from the platform. Pictures of luxury items, expensive watches, 5-star hotels attract lots of engagements on Instagram. One of the best things about Instagram is the ability it gives you to reach people all around the globe. Not just that, but the ability it gives you to target any specific location or region using Geotags. It should come as no surprise that posts with location have 79% more engagement than those without. People search for locations, places, hotels or regions all the time on Instagram. It’s then up to users to follow and have their favorite content appear in their feed. Leverage this feature to connect with users better. To get users engaged with your specific Instagram location, you have to start tagging your own content as well. With over 300 million daily users, Instagram Stories has been one of the biggest successes for the platform since it began. Every single day, Instagram users spend around 28 minutes on Instagram Stories on a daily basis. It’s popularity rose pretty fast causing other social networks (facebook, whatsapp) to adopt the feature too. Ideally, we used to rely on the link in our bio as the only way to drive traffic from Instagram, we can now utilize Storiesin a number of different ways to promote content outside of the platform. At this point, you could only add links to your Instagram stories if you’re a business profile with more than 10,000 followers on the platform. To add a link out to a blog post, product page or pretty much whatever you like, just go to Stories, upload your engaging video or photo, and then select the link symbol at the top of the screen. Insert the link to whatever page you wish and publish. On your published story, users will see a small ‘See More’ CTA at the bottom of the screen with an arrow to Swipe. Well, if you don’t have the ability to add direct links to drive Instagram traffic, it’s a good way to send those viewing your Story to your profile, and to the link in your bio in particular. Instagram’s Highlights feature lets you combine multiple Instagram stories into long-term content your audience can discover at any time. Instagram Story Highlights are archived collections of your Instagram Stories. I’ve noticed some creatives have been using their highlights in fun ways, but there are tons of brands out there that aren’t. Whenever you promote a link or product in your stories, you would want to add or save them to your story archive. This way, new followers that haven’t seen them could do so at anytime. These tags, when clicked, will allow for a more detailed view of the product you’ve clicked on. This product view will then also have a purchase link which redirects to the retailers own product page where users can then complete their purchase. Posts that contain these product tags are called Instagram Shoppable Posts. With this, you could definitely agree that shopping on Instagram just got so much easier. Instagram has moved past the era of dropping links on your bio and on your Instagram stories hopping yours followers click in them. With 80% of Instagram’s 800 million users already following an “active shopping business” account and 200 million users visiting one or more business profiles daily, giving people the ability to shop natively within the platform sounds really good. Instagram shoppable posts are marked with a “Tap to View Products” pop-up or small white circle with the shopping bag icon. Your business must sell physical goods that comply with Instagram’s merchant agreement and commerce policies. Your business profile must be connected to a Facebook catalog. This can be created and managed on Business Manager, directly on your business’s Page on Facebook, or through Shopify or BigCommerce. Today, 67% of marketers say not only does influencer marketing work, but it helps them to reach a more targeted audience. Influencer marketing allows brands to get in front of large groups of niched-down segments of their target audience. Infact, almost 80% of influencers prefer Instagram for brand collaborations over any other channel. Find niche social media influencers in your space, connect with them and propose to work together. They basically review your product (or service) then promote it on their Instagram pages for something in exchange. Most times you either pay for this or offer your product or services for free to that influencer. The latter is preferably better if you’re just starting out. Lately, Instagram ads has seen massive growth spikes. More and more brands are jumping on Instagram Ads to grow their businesses and accounts too. More than two million companies use Instagram ads to reach audiences, engage followers, and promote their products. If your business is willing to pay Instagram to increase your visibility then I’ll advice you go for it. All marketing efforts without an action is useless. Majority of Instagram brands don’t add CTA’s to their posts hence leaving a lot of traffic/sales on the table. Though your Instagram posts shouldn’t always be about promotions, you should make it a strategy to include call to actions that cause users to click your links, share your posts or even purchase your products. User Generated Content (UGC) is one strategy that can work effectively if you already have an established audience that raves about your brand, product or services. Basically, Instagram users like getting involved and want to be a part of something. It’s always a great idea to post not your own content, but content created by your own customers. This shows potential customers your brand is customer friendly and trustworthy hence acting as social proof. In conclusion, Instagram is one of the best social networks for businesses in 2019 and when done right, you could eventually break the noise and reach thousands or even millions of people on the platform. These strategies are of course effective but also time consuming. Click Here to Start your 3 days ($28) FREE Instagram Growth Management. Thank you for reading and don’t forget to drop a comment letting us know what your favorite Instagram strategy is. Also, we’ve created a cute Instagram-worthy image you could post on your Instagram page if you enjoyed this post. Don’t forget to tag us @GETSOCIALGEAR when you do.